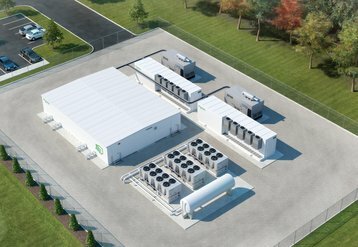 Critical infrastructure specialist Schneider Electric has launched a range of containerized power modules for data center owners and operators, rated between 625kW and 1.25MW. The modules include UPS systems, batteries and switchgear, ready for deployment outside of the building. The company has also unveiled a range of modular data centers pre-certified by Uptime Institute: customers can now order a 90kW all-in-one data center with redundant components, or a full-blown Tier III concurrently maintainable facility with 500kW of capacity - just add power and cooling. Both of these announcements were made at DCD>London conference and expo at the Old Billingsgate Market on Monday, and are applicable to the markets that use 400V supply voltage. The new prefabricated power modules include Galaxy VX UPS systems with Li-Ion battery options, Prisma LV switchboards and a fire suppression system. “Everything that we can do in a typical electrical room, that Schneider provides, we are doing the same thing to modules,” said Scott Neal, global product marketing director for prefabricated data centers at Schneider Electric. Meanwhile, the new TIER-Ready range offers reference designs for quick construction of data centers: each design includes comprehensive technical documentation, schematics, and has been tested by Uptime Institute - an authority on data center design - to verify their advanced reliability features. These products are not based on classic ISO shipping containers, but have been inspired by their stackable design, with the entire construction manufactured by Schneider, and featuring, among other things, a slanted roof. The 90kW reference design is a single module, while the 500kW design consists of seven modules back-to-back and is able to accommodate almost 100 racks. All modules ship out with power distribution, fire protection and server-side cooling pre-fitted. “We went through the entire design cycle with Uptime: they gave us feedback, we’ve made changes, there was a bit of back and forth, and in the end they gave us a TIER-Ready stamp,” Neal said. To truly achieve Tier certification, the modular deployment would still need to be inspected by a representative of Uptime Institute, but Uptime says it will save the operator up to 50 percent of cost, and reduce the time and effort spent on both sides. The reference designs are fully compatible with Schneider’s EcoStruxure family of management tools - including the newly launched cloud version of EcoStruxure IT Expert, which has, as of today, arrived to Europe.